I think it should be just “allows Outbound Internet traffic” — there is no need (and src addresses cannot be specified for outbound rule in a security group) to specify that it should allow traffic from instances in private subnet. Is my understanding correct? NAT is used for instances in private subnet only. But within those instances not all would need to connect to internet and need to be completely isolated within the AWS network only. Security groups/CIDR address can be specified from which the NAT should accept the outbound internet traffic. should this instead be “Disable Source/Destination Check on the *nat* instance”. I believe disabling source/destination checks on the EC2 instances launched in the private subnet is not required. a public subnet (20.0.0.0/24). The user’s data centre has CIDR of 20.0.54.0/24 and 20.1.0.0/24. If the private subnet wants to communicate with the data centre, what will happen? Hello Jayandar, Could you please explain how overlapping happened in this case ? >>>A web company is looking to implement an external payment service into their highly available application deployed in a VPC. Their application EC2 instances are behind a public facing ELB. Auto scaling is used to add additional instances as traffic increases. Under normal load the application runs 2 instances in the Auto Scaling group but at peak it can scale 3x in size. The application instances need to communicate with the payment service over the Internet, which requires whitelisting of all public IP addresses used to communicate with it. A maximum of 4 whitelisting IP addresses are allowed at a time and can be added through an API. How should they architect their solution? Can you please explain this scenario? Why whitelisting of public IP addresses required to communicate with payment service? Why can’t the instances just communicate with the service via ELB? How NAT instances come into this picture as there’s no mention of EC2 instances in private subnet? As there is a limit of 4 public IP address, auto scaling would break as the new instances won’t be able to call the payment service. Also ELB does not have fixed EIP nor would it be used when the call to the payment service is being made. It would go through the IGW directly. For Question 4, will you be able to explain why a is an answer and not d? Hi Prabin, as the instances are autoscaled and can increase 3x which is 6 at its peak and would exceed the allowed 4 IP whitelisting condition. Also the IPs would change if not assigned Elastic IP address which is done in option A. Why is inbound from private subnet (20.0.1.0/24 on port 80) required if we are already allowing outbound on the same HTTP protocol (0.0.0.0/0 on port 80)? I am assuming ‘security group is stateful’ means that if I have an outbound rule, then inbound rule need not be defined; so, in this case outbound on 0.0.0.0/0 range (meaning everything else) should suffice. In other words, if the security group rule did not have ‘For Inbound allow Source: 20.0.1.0/24 on port 80’, and it only had ‘For Outbound allow Destination: 0.0.0.0/0 on port 80’, The traffic would still flow from the private subnet -> NAT -> Internet just fine for patching purposes. Please correct me on my understanding. Or, are we just picking ‘For Inbound allow Source: 20.0.0.0/24 on port 80 (Refer NATSG)’ as the answer because it is a better choice than ‘For Inbound allow Source: 20.0.1.0/24 on port 80’, but both answers would be correct if we were to pick two choices? I am making my argument based on question 10 on the following post, where my assumed logic is applied for ICMP protocol. I don’t whether ICMP is a special case. Your entire AWS infrastructure lives inside of one Amazon VPC. 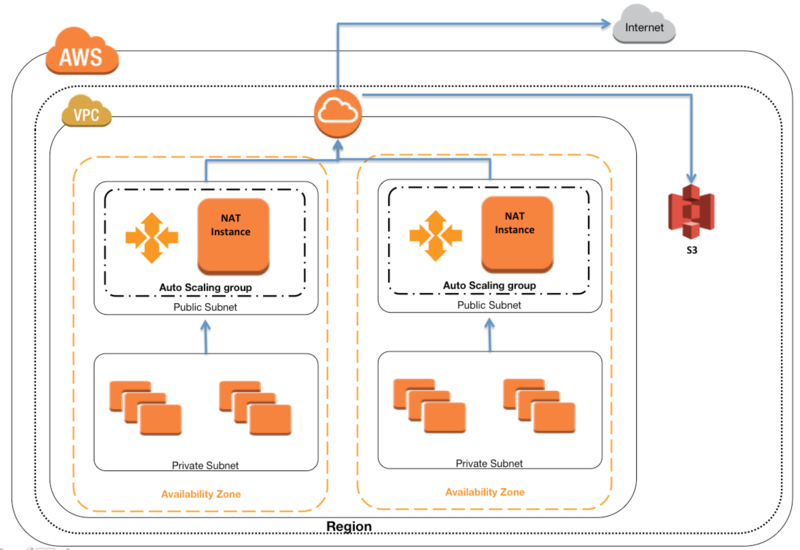 You have an Infrastructure monitoring application running on an Amazon instance in Availability Zone (AZ) A of the region, and another application instance running in AZ B. The monitoring application needs to make use of ICMP ping to confirm network reachability of the instance hosting the application. Can you configure the security groups for these instances to only allow the ICMP ping to pass from the monitoring instance to the application instance and nothing else” If so how? the questions asks what is not required. NAT is for private subnets only. Public subnets are already connected to internet gateway. Hence 20.0.0.0/24 is NOT required. For question 4, it may just be a poorly worded question, but do I need to assume since it’s Highly available that they are using two separate AZs? Otherwise A wouldn’t make sense because using two NAT instances for “HA” would require some scripting and some sort of health check that can programmatically change the route table when the primary one fails. Thanks Kyle, the questions is mainly targeting the limitation of whitelisting 4 IPs. With Auto Scaling to maintain HA that can change and hence would not work. Using NAT and Elastic IPs it would keep the whitelisting to 2 IPS irrespective of the Auto Scaling behaviour. Also, this is referring to NAT Instance and not NAT Gateway. It probably wont be mentioned on the exam for a while, but might be good to point out. Thanks Kyle, will update the same. For Question 4, I just don’t understand why do we need two NAT instances? Two NAT instances for HA, incase the instance or the AZ goes down. disallows Inbound Internet traffic from everywhere. But security group can only allow. Disallow option is provided by NACL? What is your thought on this one? disallows here is basically implicit deny. So you do not allow any rules to allow incoming traffic. It does not mention the application is in private subnets so even Internet Gateway would work. 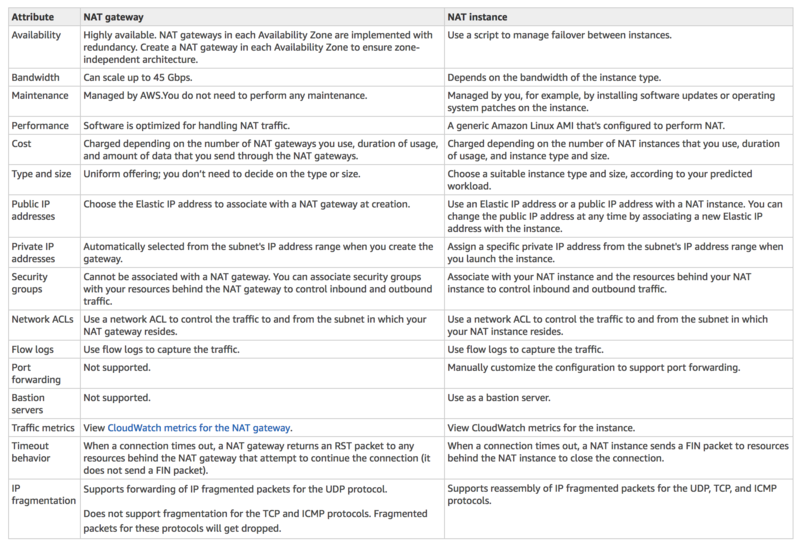 NAT gateway if the instances in private subnet.